Mercury is the smallest planet in the Solar System and the closest to the Sun. Mercury has a year of only 88 Earth days and, because it spins more slowly than the Earth, one day on Mercury takes up to two thirds of its year. During one of Mercury’s long days, the Sun makes a complete loop in the sky due to changes in the planet’s speed around the Sun. The surface of Mercury is covered in craters, as it has no atmosphere to protect it from meteorite impacts and no surface water, weather systems or volcanic activity to erode or cover them. The surface of Mercury facing the Sun can reach temperatures of above 400 °C, while at night temperatures plummet to below -170 °C. From Earth, because of its proximity to the Sun, Mercury can only be seen for about one hour before sunrise or after sunset, or during a total solar eclipse. 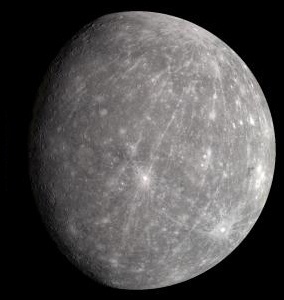 Because, like Venus, Mercury’s orbit is inside that of the Earth, Mercury can be observed in transit as it passes across the disc of the Sun and exhibits phases similar to those of Venus or the Moon.